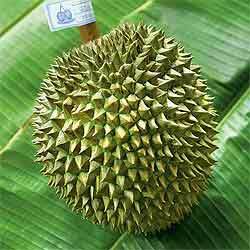 This is a Thai durian. Average size weighing between 2 - 4kg. per fruit. 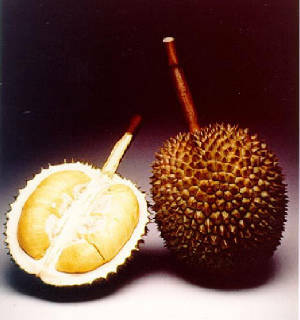 The skin is brownish green and the fruit is oval in shape and can be as long as 15 - 17cm. The flesh is golden yellow and sweet. Best specimens come from the Nonthaburi province, next to Bangkok. Kan Yao's high price -- $200 is a record. True Kan Yao from Nonthaburi have sharp spikes. Round with a long stem. Green Husk. In Thai, Kanyao means long fruit stalk. Its stalk is longer than other varieties. - Weight : 2.0 - 3.5 kg. - Average thickness : 1.45 cm.